Things that flow and also burn! Turn your stacks of saplings, wheat, nether wart, or whatever else into sweet delicious fuels to power your industrial complex! Step 1: Put water and plant materials into a Masher. The Masher will produce Biomass (not compatible with Forestry Biomass). Step 2: Put Biomass in a Bio Reactor, which is a multi-block of 34 Bio Reactor Tanks in a 3x4x3 pattern with the inside hollow and the Bio Reactor block on top. Fill it all the way and provide power for it to turn the biomass into Mash. Step 4: Put Stillage into Still along with Steam. Steam can come from Railcraft, Factorization, or by providing water and power to the Electric Boiler. Still will use Steam and Stillage to produce Ethanol (which IS compatible with Forestry). Step 5: (Optional) Use a Buildcraft refinery to turn Ethanol into Fuel (there is no advantage to this other than mixing ethanol with fuel). Step 1: Find some Buildcraft oil, because I haven’t gotten around to adding my own oil world gen. Step 2: Pump the oil into the base of a Cracking Tower, which is a multiblock structure made of one Cracking Tower Base with 5 Cracking Tower blocks stacked on top of it. Step 3: Pump Steam into the base of the tower. The steam will heat the oil and the tower blocks on top will each fill with 5 different products. Those products are ? Asphalt. One bucket of asphalt can be combined with eight gravel to make a strong Asphalt block. It doesn’t do anything but look neat. Petroleum Coke Fluid. Pump this into a Dryer and the excess water will evaporate, leaving you with Petroleum Coke, which burns twice as long as coal. Diesel. Can be burned in a Railcraft Boiler, IC2 SemiFluidGen, or Thermal Expansion Compression Dynamo, but is EXTRA effective in a Buildcraft Iron Engine. Kerosene. Can be burned in all the same machines as Diesel, but it is extra effective in the Railcraft Boiler. Gasoline. Same as above, with it’s advantage in the SemiFluidGenerator. This mod implements the new Universal Electricity 3 API. The mod will run with just Core, but the machines will only accept EU energy. HOWEVER. If you also install the UE Core mod, then my machines will be able to use IC2 EU, Buildcraft MJ AND Thermal Expansion Redstone Flux. I highly recommend you do this. Crafting recipes change depending on what combination of mods you use, so I suggest you just use NEI. Adds Recipes to Buildcraft Refinery to turn Ethanol, Seed Oil and Creosote Oil into Fuel. These numbers are completely configurable. The Water Generator is expensive, but it produces an unlimited amount of free water with no lag or flowing water blocks. Just craft it with two buckets of water and it will never run out. Toss the Liquid Fuels.jar into the mods folder. Mod is designed to work with: Universal Electricity Core, Buildcraft, Forestry, IC2, Railcraft and Thermal Expansion. None of these are required, but it’s useless without at least one of them. New Universal Electricity API automatically adds EU, MJ and RF support if you install UE Core. I recommend you do this, because otherwise my machines can only accept UE. This change also means that I had to change the internal values for energy, so they MIGHT be out of whack. Just let me know if it is and I’ll try to fine tune it. 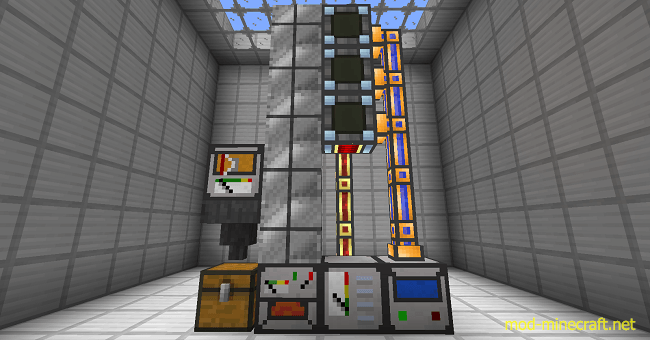 Thermal Expansion support, both power (with UE Core) and the fuels can be used in the Compression Dynamo. I actually personally asked King Lemming to add this into his API so I could do it. Fixed that bug that caused buckets to vanish. Machines won’t eat your containers anymore! Localizations for German, French and Spanish. Enosphorous did these himself using Google Translate, so if anything doesn’t work, complain to him. (No, don’t, but if you could contact one of us we could fix the files if you provide corrected ones.) Want Liquid Fuels in YOUR language? contact one of use about that too and if you do the translations, we can put them in the mod. Added tool tips to fluid tanks. They’ll tell you what fluid is in the tank and how much. Fixed some leaves not working in Masher.